Home of the Poetry Society, the Poetry Café in London’s Covent Garden is not only a vegetarian café in its own right, where you can enjoy a cup of tea and a flapjack as you scribble some verse in your notebook, it’s also a buzzing performance venue! As a setting for poetical performance, it comes alive at night, as you can grab a drink from the bar whilst you enjoy one of the café’s numerous events, including book launches, recitals, music concerts and much, much more. Also make sure you check out their programme of exhibitions. They are currently showing Versed in Print: East London Print Makers, which displays a variety of handmade prints that contain poetic and literary references, all of which are for sale! 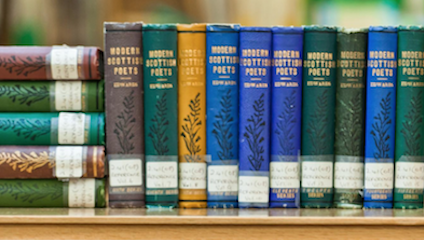 Advocating poetry, and Scottish poetry in particular, the Scottish Poetry Library is a national resource that brings poetical pleasure to the masses, and currently houses approximately 45,000 items that range from books to magazine cuttings, pamphlets to CDs! They even have some special collections where they house fragile and rare items, including the Edwin Morgan Archive and the Ian Hamilton Finlay Archive. As well as being able to borrow certain items to enjoy in the comfort of your own home, the library has an online catalogue, and hosts exhibitions and events. You’re aliter-ate to catch TNS x SPL which featured responses to the library’s collection by artists from The Number Shop (artist led organisation supporting graduates), but you can always keep an eye on their events page to see what plans they have for the future, listen to their podcast series, or take a look at the poems they have chosen to feature for National Poetry Day that are based on the theme of change and can be bought on printed cards in public libraries around Scotland. If you like going to music gigs, why not try something a little different and check out a poetry performance night? Running every third Monday of the month, Milk Poetry is a Bristol based event that nurtures home grown talent and promotes high quality spoken word poetry. Its next event on 8 October is set to be a special one, as it is part of Milk Poetry’s 4 birthday month celebrations and is headlined by Birdspeed, who merges her talents in poetry, prose and dance to convey messages and storylines. It will be hosted by the Crofters Rights in Stokes Croft, which means you can enjoy a spot of verse in a warm, welcoming environment as you enjoy what the pub claims is Bristol’s highest quality cider and pizza. Alternatively, you can catch Milk Poetry as part of Bristol’s Festival of Literature, when they will be hosting an evening at Foyles Bookshop on 26 October. If you’ve got a penchant for poetry, then head up North to the recently dubbed UNESCO City of Literature for Manchester Literature Festival. Running for its 13th year, the festival features a plethora of events celebrating the written word from world premieres of new work commissioned for the festival (including the annual Castlefield Manchester Sermon by Michael Morpurgo) to walking tours around the haunts of Manchester’s “literati”, work from a multitude of cultures and countries as well as the chance to revisit the oeuvres of literary icons. Poetry lovers should be particularly excited by Carol Ann Duffy’s delivery of her final collection as Poetry Laureate on 11 October, and of course the Manchester Cathedral Poetry Prize giving event, which will be hosted in the magical place of worship, and will include readings from this year’s winners. Manchester Literature Festival runs from 6 – 21 October at locations around the city. Check out the full programme for more information. Oxford-based group Back Room Poets, are celebrating National Poetry Day at Oxford University Natural History Museum. Their event Infinite Forms will include readings by local poets of work inspired by the museum’s collections and exhibitions, and will be followed by an open mic session where you can have a go at performing your own natural history inspired poetry!